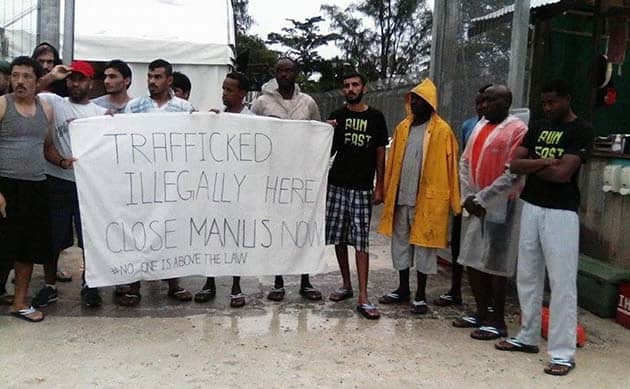 On 14 May, hundreds of asylum seekers and refugees joined together for the biggest protest inside the Manus detention centre since the mass hunger strike of 2015. The protest followed the PNG Supreme Court ruling that the Manus Island detention centre was unlawful and immediate steps should be taken to close it. But after almost two months, the detention centre remains open. The uncertainty surrounding the fate of the asylum seekers and refugees there has brought increasing tensions. The hundreds of people who have endured the brutality and deprivations of Manus Island have been told that their detention is unlawful, but they remain prisoners. It is an untenable situation and slowly but surely the management of the centre is breaking down. The questionable legality of Broadspectrum or Wilson Security’s authority in the centre has created a power vacuum that they have tried to fill by using the PNG police. PNG police have become the de-facto power in the detention centre and are a constant presence in the centre and at the gates of the various internal compounds. That has also meant increased repression as police now use powers of arrest to maintain control. So, one Iranian man was arrested for being in the internet room “out of turn”—and is now facing charges of assault. Two other Pakistani men were charged with assault over a trivial exchange with a Wilson Security guard who blocked their entry into one of the internal compounds. As Solidarity goes to press, at least seven detainees are in the Lorengau police watch-house waiting for court. The police shooting of students in Port Moresby has raised fears of the same lethal force being used against refugees on Manus. Police-supported vigilante action on Manus in 2014 left Reza Barati dead and around 80 others wounded. Despite the Australian government stalling over the closure of Manus, it is just a matter of time. The PNG government has restated that Manus will close. The Chief Justice of the PNG Supreme Court has joined two constitutional cases challenging the Manus centre. The Namah case, which was the basis of the finding in April that the agreement between Australia and PNG was unconstitutional, has been joined with the Ben Lomai case that actually represents the hundreds of detainees on Manus. The joining of these two cases opens the way to further court orders as early as 16 June, or the full bench hearing on 30 June, that the Manus detainees must be released and returned to Australia. No matter which party wins the federal election, there will be no avoiding that offshore processing on Manus is finished. Meanwhile, the conditions deteriorate. With its future uncertain, Broadspectrum seems to have cut back staff already. There are long queues for meals and the food is bad. The same chicken is served twice a day and it smells off. Around 520 refugees now have to eat in the one mess areas in Oscar compound, and sometimes the food runs out. The absurdity of the situation is shown in the Orwellian language changes—“detainees” or “transferees” are now “residents” and compounds that still hold asylum seekers prisoner are now East and West “areas”. But the language change can’t hide the reality; residents are still arrested. And there are still restrictions on movement between compounds. Mobile phones cannot be taken outside the camp. People are scanned and property is searched for contraband when they come back from “outside”. But the end of Manus Island is closer than it has ever been. There will still be a fight over what the Australian government does with the people from Manus Island. But the refugee rallies at the start of Refugee Week are an opportunity to tell the government that they have no option other than to “Bring Them Here,” to the mainland. No ifs, no buts.